We’re waiting for news of the transmission for the caddy project so in the meantime we’ve sourced new interior center console pieces for our VW Golf 1.8T to keep the momentum going this 2015 season. These “updated” pieces are found in 2004 and newer models but actually made their debut in 2003 with the “20th Anniversary Edition” GTI. The e-brake handle is a perforated leather version with white stitching and a brushed aluminum release button. 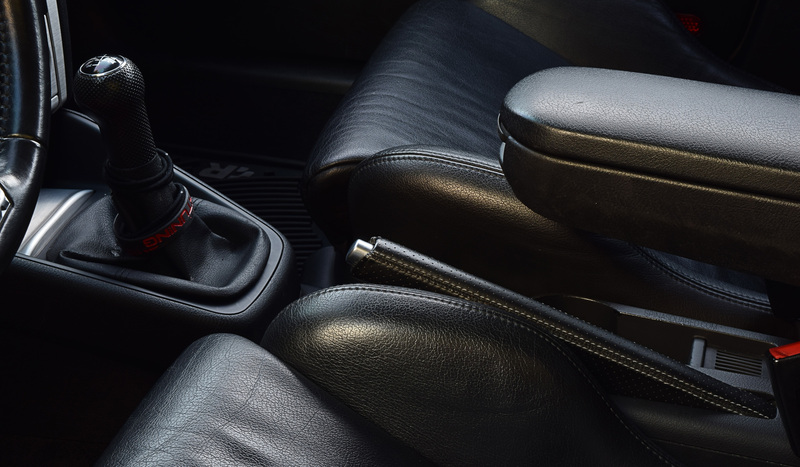 The center console’s design eliminates cup holders in the dash on the newer models, relocating them next to the e-brake handle between the two front seats – A much better design. Since we are able to retain the original cup holders our Golf 1.8T now features a total of 5 with the new center console, one for every passenger! Notice the older shift-surround piece above on the right compared to the newer one on the left? And below is the end result that includes a new leather-topped arm rest to match our leather seats, replacing the older cloth-topped version. And yes, those are the bolsters of R32 seats! We scored those and the R32 steering wheel a little over a year ago. A 5-speed “R-line” shift knob and boot, leather door cards, and a couple more OEM brushed aluminum trim pieces should complete most of the interior refresh… For now.